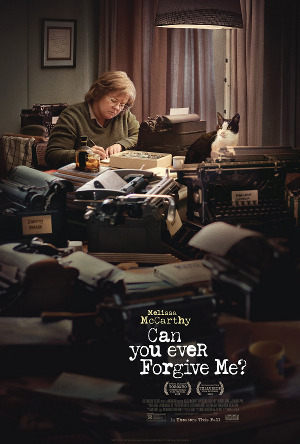 'Xplosion of Awesome: Can You Ever Forgive Me? Melissa McCarthy stars as writer Lee Israel who resorted to forging documents from deceased authors and playwrights when her own career hit rock bottom. Can You Ever Forgive Me? has a couple of things going for it, the first being McCarthy. The dramatic role is quite a departure from McCarthy's usual loud and obnoxious comedies. Although neither McCarthy nor the script (based on Israel's own autobiography) can ever make the protagonist sympathetic, it is nice to see the actress take on a more serious role. The second thing the film has going for it is Israel's story. While forgery is quite common, hers was an unique tale showcasing the author's hidden talent in crafting plausible fakes from literary's best. Forgery by typewriter, however, does have a downside in that it isn't very cinematic. Unlike movies about art forgery, Can You Ever Forgive Me? lacks great visuals to help sell the suckers (and the audience) on the con. A common theme in films like this is the charming forger, who the audience begins to root for to succeed. That's never an option here as McCarthy's ball-busting portrayal is anything but sympathetic. Can You Ever Forgive Me? also runs away from Israel's homosexuality, refusing to make it part of the story while instead ramping up the performance of Richard E. Grant as Lee's gay confidant. With the focus firmly on McCarthy and the forgery, the film lacks the time to delve further into the personal relationship between the pair as Grant becomes mostly-underutilized as window dressing. Can You Ever Forgive Me? is a curious film, worth a look; I just wish it had more to say.